A witch trial by Joseph E. Baker in 1892. Click for prints & products. Court of Oyer and Terminer – The term, “oyer and terminer” is a partial translation of the Anglo-French phrase “oyer et terminer” which literally means “to hear and determine”. In English law, courts oyer and terminer were commanded to make diligent inquiry into felonies and misdemeanors specified in the commission. The inquiry was by means of the grand jury and if a defendant was indicted, the accused would be tried, judged by a jury, and if found guilty sentenced to punishment by the court. In mid-May of 1692, newly appointed governor Sir William Phips returned from England to find dozens of accused witches filling the jails and more accusations threatening to overwhelm the local courts. The Governor then established a special court of Oyer and Terminer, with Lieutenant Governor William Stoughton as its chief magistrate. Phips also appointed several prominent figures of the area to serve as Associate Magistrates including Jonathan Corwin, Bartholomew Gedney, and John Hathorne of Salem Towne; John Richards, Peter Sergeant, Samuel Sewell, and Wait Still Winthrop of Boston; and Nathaniel Saltonstall of Haverhill. Thomas Newton would serve as the Crown’s Attorney prosecuting the cases, and Stephen Sewall would serve as clerk. 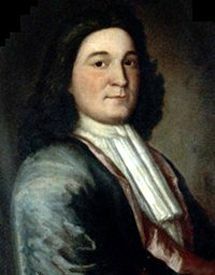 The Court of Oyer and Terminer convened in Salem Towne on June 2, 1692, with Chief Magistrate William Stoughton presiding and Thomas Newton serving as the Crown’s Prosecuting Attorney. Bridget Bishop’s case was the first brought to the grand jury. The fact that Thomas Newton, special prosecutor, selected Bishop for his first prosecution suggests that he believed the stronger case could be made against her than any of the other suspect witches. He was evidently correct, because the Grand Jury indicted her, she was tried, and sentenced to die. On June 10th, she was hanged at Gallows Hill. Following the hanging, Magistrate Nathaniel Saltonstall of Haverhill resigned from the court, disagreeing about the use of spectral evidence. Later, he would become prominent critic of the Salem proceedings and was himself accused of witchcraft. He was replaced by Jonathan Corwin of Salem. The next month, on July 26th, Thomas Newton also resigned to assume a position in New Hampshire. He was replaced the next day by Anthony Checkley. In the Fall of 1692, Thomas Brattle, a well-educated and prosperous Boston merchant, who served as treasurer of Harvard College and was a member of the intellectually elite Royal Society, would write a letter that would soon bring the disgraceful affair to an end. Writing to an English clergyman, his letter, which was very critical of the Salem witch trials, was soon circulated widely in both England and in Massachusetts. Brattle presented compelling arguments against the legal premises and procedures involved in the afflictions, accusations, and executions, with a particular focus on the validity of spectral evidence in proceedings. This letter had a great impact on Governor William Phips, who, on October 8th, ordered that reliance on spectral and intangible evidence could no no longer be allowed in trials. Just three weeks later, on October 29th, he prohibited any further arrests, released many of the accused witches, and dissolved the Court of Oyer and Terminer. The Superior Court of Judicature was then formed to replace the “witchcraft” court, which did not allow spectral evidence. The new court released those awaiting trial and pardoned those awaiting execution. In effect, the Salem witch trials were over. But, during the reign of the Court of Oyer and Terminer, they had execute 20 people accused of witchcraft. Superior Court of Judicature – On November 25, 1692, the General Court of Massachusetts passed legislation creating the Superior Court of Judicature and various lower courts. The Superior Court was again headed by William Stoughton, as Chief Justice, with Anthony Checkley continuing as the Attorney General, and Jonathan Elatson as Clerk of the Court. The four Associate Justices were John Richards, Samuel Sewall, Wait Still Winthrop of Boston, and Thomas Danforth of Cambridge. The five Justices sat for the first time on January 3, 1693, in Salem Towne. This court; however, was required to ignore spectral evidence as unreliable. During this first session, five cases were tried that included those who had been indicted but not tried in September — Sarah Buckley, Margaret Jacobs, Rebecca Jacobs, Mary Whittredge and Job Tookey. All were found not guilty. Grand juries were also held for many of those remaining in jail. Though charges were dismissed against many, 16 more people were indicted and tried, three of whom were found guilty: Elizabeth Johnson Jr., Sarah Wardwell and Mary Post. However, when Chief Justice William Stoughton wrote the warrants for the execution of these women and the others remaining from the previous court, Governor Phips pardoned them all, sparing their lives. In late January/early February, the Court sat again in Charlestown, Massachusetts to hold grand juries and trials. They tried five people — Sarah Aslett Cole, Lydia Dustin, Sarah Dustin, Mary Taylor and Mary Toothaker. All were found not guilty. However, they were not released until they paid their jail fees. Unable to pay, Lydia Dustin died in jail on March 10, 1693. At the end of April, the Court convened in Boston and cleared Captain John Alden by proclamation, and heard charges against a servant girl named Mary Watkins, for falsely accusing her mistress of witchcraft. In May, the Court convened in Ipswich, where they held a variety of grand juries who dismissed charges against all but five people. 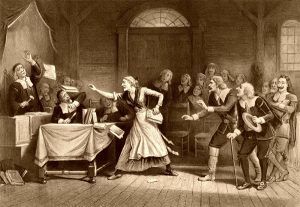 These included Susannah Post, Eunice Frye, Mary Bridges Jr., Mary Barker, and William Barker Jr. All were found not guilty at trial, putting an end to the infamous Salem Witch Trials. However, the Superior Court of Judicature continued to serve. In 1780, after the adoption of the Massachusetts Constitution, the name of the Court was changed to the Supreme Judicial Court. It continues to serve today and is believed to be the oldest appellate court in continuous existence in the Western Hemisphere.